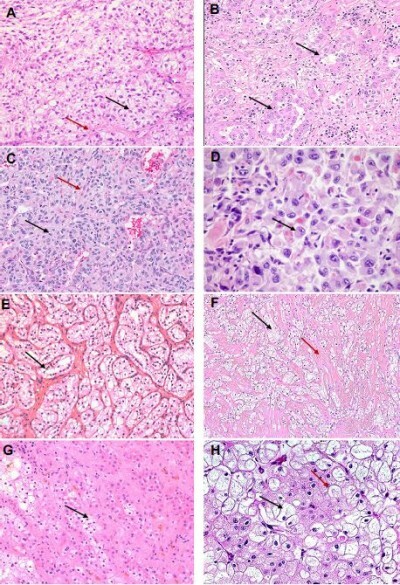 Abstract: Over the past few decades, the classification system of renal cell carcinoma (RCC) variants has witnessed tremendous and ongoing refinement driven by genomic profiling and morphological correlation that have provided valuable insights into tumor biology and characterization of this heterogeneous subset of tumors. The importance of accurate classification cannot be understated given the downstream impact on treatment decisions, risk stratification, and need for genetic testing. While the morphologic heterogeneity across these tumors is increasingly being recognized, all non-clear-cell RCCs are commonly categorized under one therapeutic category with management strategies that largely derive from clear-cell RCCs. As research in metastatic RCC progresses, there is a growing focus on rare subtypes and unclassified tumors, which is rapidly changing the treatment paradigm for non-clear-cell RCC. This review focuses on the histomorphologic diagnostic challenges of unclassified RCCs discussing the utility of contemporary diagnostic tools. It further discusses the current state of knowledge and guidelines for management of this class of tumors.